Insect Hotels - All things related to Insect / Bug Hotels. Insect Hotels: The Grass-Free lawn, perfect for pollinators! Today we thought we'd share a video on the BBC website from last month. Mainly because it sticks in the mind. The video looks at the Grass-Free lawn that has opened in Kensington and Chelsea’s Avondale Park. The lawn is the world's first public grass-free lawn. It was developed by Lionel Smith, PhD researcher from the University of Reading. He states that research shows that the lawn provides a better habitat for pollinating insects than traditional grass. It looks awesome and so colourful! It's great for pollinators and it has been designed exactly for that reason. 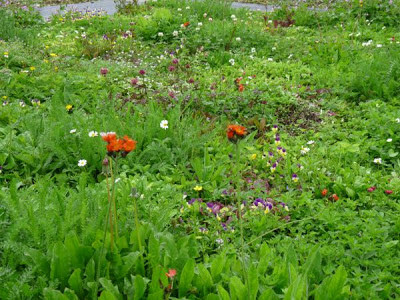 Within the 200-square-meter lawn, there are over 30 species. including; mint, chamomile, daisies, thyme and red-flowering clover. With no grass and more flowers, the lawn requires a lot less mowing, only 3-9 times a year, and watering, and no fertiliser. Which means it's a lot more "Eco-friendly", as well as being beneficial in terms of biodiversity and for all those pollinators. We here at Insect Hotels think its great!! What do you think?